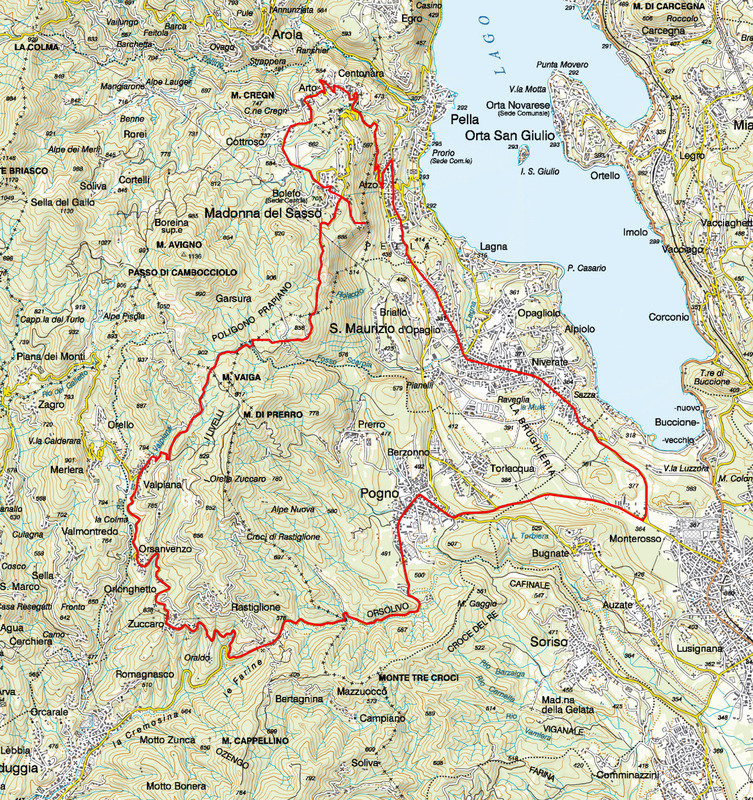 THE FOLLOWING ROUTE REFERS TO THE MAP OF CYCLING ROUTES IN THE DISTRETTO TURISTICO DEI LAGHI MONTI E VALLI. A PRINTED VERSION IS AVAILABLE AT THE TOURIST OFFICES OF THE TERRITORY AND IN EBOOK FORM BY CLICKING HERE. Starting from the main square of Pogno, shortly after the parish church, you set off along the Cremosina road climbing slowly to the S. Bernardo tunnel. Exiting the tunnel, turn right after a hundred meters and follow the signs for Zuccaro and Valpiana. The road rises steeply and on the left we come to the turn off for Oraldo. Continue straight on until you reach Zuccaro, a village in the district of Valduggia. Continue uphill passing the villages of Seula, Orsanvenzo and then to Valpiana. Here the road climbs steeply with a series of hairpin bends. Take special care as the road surface is in very poor condition. Continue through the woods of birch and beech trees and then pass through the Sabbioni area of white granite blocks in decomposition. At the entrance to Boleto turn right and follow via Monte Avigno. When you come to the Sanctuary of the Madonna del Sasso (Our Lady of the Rock) its panoramic square with a view of Lake Orta. Retrace your steps and follow via Santuario, then at the stop sign turn right along via Riotti. At the next stop sign turn left and then follow the signs for Artò and Centonara. Continue past the sports field passing through the small village of Artò. On the left you come to the parish church of San Bernardino and continue downhill in the direction of the village of Centonara. Keep going in the direction of Alzo di Pella and turn left at the end of the descent at the stop sign, then at the next stop turn right toward the centre of the village of Alzò. Pass the parish church and a roundabout and then turn left downhill following the signs for Pella. The route descends rapidly to the church of S. Filiberto. At the stop sign turn right and continue in the direction of San Maurizio d'Opaglio. After the climb you come to the traffic lights. Here you turn left along via Roma in the direction of Gozzano. Continue on a long flat stretch to the area of the sports field in Gozzano. At the roundabout turn right in the direction of Pogno and after the ordeal of a last steep climb (known as il chilometro the kilometre) you return to the starting point at Pogno. To see : the Sanctuary of the Madonna del Sasso (Our Lady of the Rock), the Church of San Filiberto of Pella.